Description: Our beautiful princess has to get ready for a very special dinner with the prince, but she can't find her things in time, will you help her out? Pearls, tiaras and teacups are scattered around the bedroom, and when you find them Beauty's hairstyle changes. 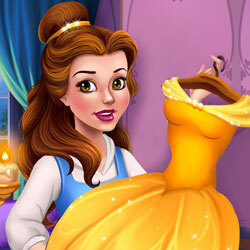 Finish in time the search and dress up the princess in a fabulous gown to match her new hairdo.